In the late 17th century, Isaac Newton was ready to publish his masterwork Principia . The Royal Society was ready to publish his book, too, except the society had a little cash-flow problem. It had blown its budget on a book about fish. Rich Royal Society member Edmond Halley came to the rescue, enabling the publication of Newton's book. As thanks, Halley found himself nearly buried in a mountain of surplus fish books. The lavishly illustrated fish book, available only in Latin, posthumously preserved the research of Francis Willughby. Today, Willughby (whose name is sometimes spelled Willoughby) is often written off as just the guy who got in Newton's way. He was more than that. In his short life, he contributed to the study of fish, fossils, botany and birds. He was a great naturalist. Francis Willughby was born in 1635 at Middleton Hall, Warwickshire. His father, Francis, was a sweet-tempered man with precarious health. His mother, Cassandra, was formidable but devoted to her family. Not much is known about the young Francis's early days, but he entered Trinity College, Cambridge, in 1652, when he was just 16. He earned his Bachelor of Arts in 1656 and stayed on to earn a Master of Arts. He was known as a virtuoso, meaning he was an amateur with a pedigree. Like his father, he was sickly, and friends often warned him not to push himself too hard. Besides his dad's frail health, the young Francis apparently also inherited his dad's desire to get along. Willughby had to act as sheriff around Middleton, but he hated cracking down on people struggling to get by. He contrived methods of just not seeing beggars. Members of the Willughby family were royalist sympathizers, and they were lucky to escape the Civil War unscathed. 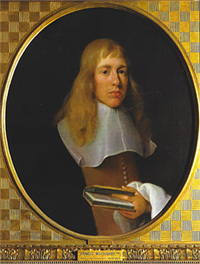 Despite England's polarized society, Willughby became good friends with a fellow student who happened to be a Cromwell supporter, Philip Skippon. But Willughby's closest friendship was probably with his tutor John Ray. The two traveled together and collaborated for years. Just as Ray was giving up his Trinity post to avoid signing a post-Restoration loyalty oath, Willughby invited him on a lengthy trip to the European Continent. The trip was a budding naturalist's dream. In Strasbourg, Willughby bought a beautifully illustrated homemade book of nature illustrations. In Altdorf, he perused a mineral-and-fossil collection rich in ammonites and not-yet-understood shark teeth. In Bologna, he wandered through rooms bursting with thousands of specimens that had belonged to Ulisse Aldrovandi. In Padua, he bought a small herbarium. But of all the places the travelers visited, Venice was probably their favorite. The fish market alone was a natural-history education, boasting some 60 fish species and 20 marine invertebrate species. With limited time and limited artistic ability of his own, Willughby purchased watercolors of Venetian fish. The young men took a trip to Murano to see glassblowing. They attended a play where well-off audience members hid behind carnival masks, and the performers shocked the travelers' English sensibilities. Willughby also purchased a remarkable example of local craftmanship: a tiny gold chain weighing no more than "a grain of corn" attached to a flea. Yes, a flea. Willughby let the flea feed on his own blood daily. He kept his tiny charge alive for several months before the flea expired from wintertime cold. In between ogling collections and plays, the travelers collected bird specimens and eggs, carrying out thorough dissections. While in England and abroad, Willughby exhibited a tremendous capacity for detail. When looking at European rollers, he noticed more than the vivid blue feathers. He noticed wart-like features near the eyes and forked appendages on the tongue. In herons, he detected reversed vertebrae that gave those birds their distinctive curved necks. In fact, Willughby caught details in dozens of birds, details that would eventually be described in The Ornithology of Francis Willughby . 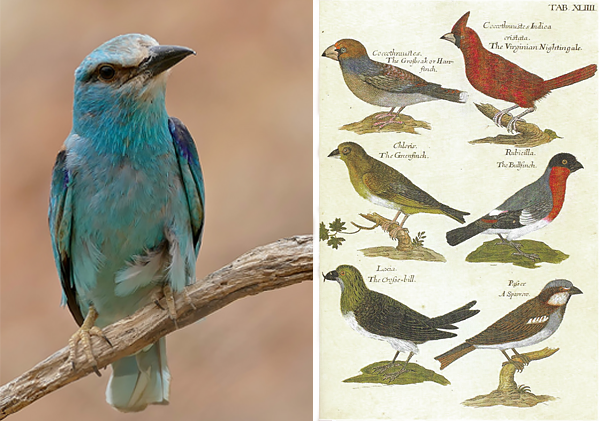 European roller photographed by Bernard Dupont (some rights reserved) (left). Plate from The Ornithology of Francis Willughby , now appearing in The Wonderful Mr. Willughby by Tim Birkhead (right). After Italy, Willughby moved on to Spain, and hated it, putting his dislike down to barren soil, abundant prostitutes and lazy people. After seeing Spain, he had to cut his trip short and hurry home when he learned his father was ill. He was lucky to get home while his father was still alive, but the ailing man died soon after, and young Francis had to take over running the estate. He also invited Ray to move in to Middleton Hall. Willughby and Ray worked together for years, not just describing and arranging illustrations of animals and plants, but also trying to impose a coherent classification system on what they studied. Linnaeus wasn't the first to try to organize the natural world. Besides Willughby's mother Cassandra and his friend Ray, Willughby's sister also passed plenty of time at Middleton, having a son of her own and an unhappy marriage. As the years passed, Cassandra Willughby sometimes despaired of her son ever producing an heir, but when he was 32, Francis finally settled on a bride about 10 years younger than himself: Emma Barnard. They had three children — and only four years together. Willughby was ill multiple times between 1668 and 1671. In 1672, he awoke one morning realizing he was again ill, and soon realizing that this time, he wasn't going to recover. He signed his will, asked Ray to look after the education of his children, and soon died. He was only 36. Emma was devastated, unable to stop crying for months. Before Francis's death, she had been on friendly terms with Ray, but that soon soured. She may have resented Ray, along with Francis's other friends, for taking up so much of his time before he died. At the urging of friends, she remarried in 1676. Her second husband was Josiah Child, a governor of the East India Company. The man was frankly greedy and mean, and before long Francis Jr. ran away from home. At one point, the prosperous Child actually tallied up a list of expenses he had incurred raising Emma's children. The same year Emma remarried, Ray published The Ornithology of Francis Willughby , though the first release was in Latin. Two years later, it came out in English. The book was the gold standard for bird studies for centuries. In 1686, Ray published the fish book, the same one that nearly derailed Newton's work. After Ray and Willughby were both dead, their insect book was published. Science historians have sometimes pegged Ray as the true genius and Willughby just a rich, lucky sidekick. But Willughby's eye for detail and commitment to classification counted among the great contributions to 17th-century natural history.